Backdrafts create a downward pressure that causes the smoke and gas from a wood fire to flow back into the home, presenting a safety threat, especially if any of the residents suffer from a respiratory disorder. The backdraft may also result in sooty smoke leaving its mark on the walls and ceiling of your home. Any type of chimney backdraft requires immediate attention. Brick chimney on the side of a house. 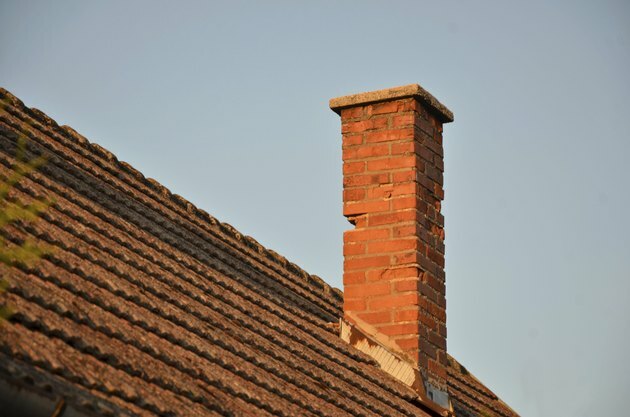 A chimney must have good air circulation at its opening to function properly. Some backdrafts result from external obstructions blocking or interfering with air movement around the chimney. A large tree near the chimney, for example, might result in poor air circulation and a resulting backdraft. Extending the height of the chimney top can often solve the problem, as taller chimneys draft more efficiently than shorter ones. Clay chimney pots are an old-fashioned, but effective method of increasing chimney height and improving draft. A house develops negative pressure when more air is sucked out of it than comes into the house. One of the primary causes of backdrafts, negative pressure can occurs when certain appliances, such as kitchen or bathroom exhaust fans, draw air from the home. Avoid running any exhaust fans when you have a wood fire burning. You might also relieve the negative pressure by opening a window to let in more air. Fireplaces and chimneys operate on the principle that hot air rises. The fire's heat creates an updraft that draws smoke through the chimney and out of the house. When you first light a wood fire, it might not create enough heat to start an updraft immediately, allowing a backdraft to occur. You can remedy this problem by using newspaper or extra kindling to create a hotter blaze as the fire first ignites. A strong wind blowing down the chimney may interfere with the chimney's ability to retain an effective updraft. The design of the chimney cap may also cause drafting problems. Special types of chimney caps, however, can take advantage of the wind to eliminate backdraft. These caps consist of two hoods positioned to guide the wind around the unit. As the wind flows around the cap, it creates an updraft, drawing smoke and gases from the chimney. What Is a Damper on a Furnace?